George Graham Reviews The Kennedys' "Stand"
It's possible, here in the 21st Century, to go through your day without ever hearing any piece of music recorded after about 1972. Commercial radio oldies formats are ubiquitous. Much of the reason for this is pure economics: we Baby Boomers supposedly still have a lot of money to spend; advertisers want to reach us; everybody likes the music of their youth; ergo, to try to sell products to Baby Boomers, give them -- or us -- music from the 1960s, so that we presumably relive our youth, however misspent. The current ubiquity of what was is essentially a relatively small number of recordings and artists from that period -- many of which, by the way, when evaluated from a purely dispassionate artistic standpoint are not really that good -- has definitely had its effect on younger generations. While there is plenty of music that can be properly claimed by today's youth, there is also perhaps more retro music being made by younger musicians now than I ever remember happening in the past. In other words, kids are making music like their parents' and that, since the beginning days of rock & roll, is something that is not supposed to happen. This somewhat jaundiced observation comes to mind after spending time with this week's album which is one of the most enjoyable 1960s-flavored retro pop recordings I have heard in a long time, in a field which is getting fairly crowded these days. It's by a couple of Generation X-ers who have captured the spirit of melodic, jangly 1960s folk rock and have done it better, for the most part, than the original music was. 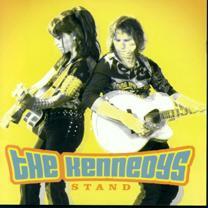 They are the Kennedys, and their latest CD is called Stand. The Kennedys are the husband-wife duo of Pete and Maura Kennedy, who have been making music together for almost 15 years now. Pete Kennedy appeared first, in the 1980s as a solo singer-songwriter, even then decidedly showing influence by the Byrds. This is approximately the seventh joint Kennedys release, and throughout their career they have been straddling the singer-songwriter approach with their increasing penchant for retro sounds. They have ranged from folky to 1960s psychedelic, in their various recordings, most of which have been independent releases, and all of which have made for worthwhile listening. But their new release Stand is probably their best yet. The CD is full of the tuneful charm, ringing jingle-jangle guitars, almost anthem-like melodies that stick in your head, strong vocal harmonies, and lyrics that tell a story or verge on the philosophical. Maura Kennedy's vocals -- and she sings the lead on all the tunes here, rather than taking turns with Pete as has been the case in the past -- are almost irresistible with their clear folk-influenced sound, and kind of built-in innocent smile. The Kennedys are also multi-instrumentalists. All the sounds on the CD are created between the two of them. Maura plays mainly guitars, and Pete guitars, bass and drums. They have a couple of guest backing vocalists on one tune, but otherwise, it's just the two of them making a kind of multi-layered sound reminiscent of a cross between the Byrds and the Beatles. Not all of the album is quite as bright and sunny in sound. Don't Hold Your Breath is brings decidedly more bluesy atmosphere, along with a dose of cynicism to its lyrical outlook. It's an interesting change of pace and well-done. Stand, the new release by the New-York-based retro folk-rock musical couple The Kennedys is the best release yet from this long-running duo. They distill the charm and literacy of 1960s folk-rock, jettison the excess and rampant self-indulgence of that period, and give us an idealized mix of the Byrds and some of the better female pop vocalists of that period. The Kennedys do play the retro angle to the hilt, with the paisley motif of the CD's artwork and their Carnaby Street wardrobe. And lyrically the songs do borrow a fair number of catch phrases from 35 years ago. But the overall result is tasteful and original enough not to be dismissed as a complete throwback. Sonically, we'll give the CD about a B-minus, for excessive volume compression. Pop music like this is not really known for a lot of dynamic range, but the volume of this CD is pumped up to the point of being fatiguing to listen to, and occasionally reaching the point of distortion. Otherwise, the mix, by the Kennedys themselves presumably in their own home studio, is quite respectable. For those of a certain age who grew up on the infectious pop of the 1960s, and for those of a younger generation who are fascinated by that period, but who are tired of the same not-very-good oldies played over and over ad nauseam by commercial radio, The Kennedys' Stand is a CD that brings fun feelings of deja vu, as well as being quite satisfying over the long term.